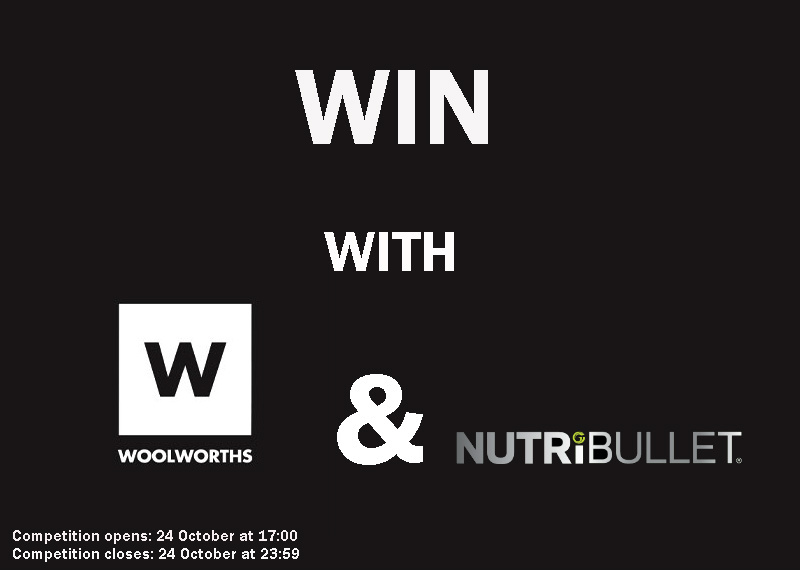 Stand a chance to win a Woolworths R500 voucher and a Nutribullet! Simply go to the Woolworths post on the Afternoon Express Facebook page and tell us what is the one unhealthy foodie habit that you want to give up and why it will help you have a healthier summer. If your comment is selected you will win a Woolworths R500 voucher and a Nutribullet. 1.2. Each person entering the Competition ("entrants/you/your") and/or accepting a Prize in terms of this Competition agree and accept that the Competition rules as set out in these terms and conditions are binding on him/her. 1.3. Important clauses which may limit our responsibility, place an obligation on you to indemnify us, involve an acknowledgment of any fact or involve some risk for you will be in bold and italics. You must pay special attention to these clauses. Entries for the Competition will open at [24 October 2016, 17:00] and will close at [24 October 2016 – 23:59] ("Competition Period"). 3.1.2. you must be a natural person. 3.3 Entrants under the age of 18 must be assisted by a parent/legal guardian, who approves of, and consents to the entrant’s possession and use of the prize, should he/she be selected as the winner. 4.1. Entrants must reply to the competition post on the Expresso Facebook page. Entrants must [Comment on the Woolworths post on Afternoon Express’s Facebookpage, telling us what their unhealthy foodie habit is that they want ot give up to have a healthier Summer 4.2. Once you meet the requirements set out in clause 3 above and this clause 4, you will automatically be entered into the Competition. 4.3. There is no restriction on the number of entries, provided that each entry is a unique entry (e.g. not the same reply of the same answer). 4.4. No automated entries will be allowed and all entries must be made by a natural person manually. 4.5. If an entry was submitted in a manner which in our discretion may provide you with an unfair advantage over other entrants, you will be disqualified from this Competition. 5.1. On [26 October 2016, 17:00], a panel of judges, who are appointed by us, will select  persons from all valid entries received during the Competition Period as the winner of the Competition (“Winner”). The Winner will be determined in the sole and unfettered discretion of the judges as the entrant who gave the most entertaining and/or interesting answer to the question referred to in clause 4.1 above. You acknowledge and accept that determination of the Winner will be at sole and unfettered discretion of the judges. 5.2.The Winners will be contacted by a representative of the organisers via the social media platform on which they entered between [24 October 2016, 17:00 – 24 October 2016 23:59]. 5.3. If the Winners have not replied to our notification messages by 0h00 on [25 October 2016], and after we have made at least 2 (two) attempts to contact the Winner, the Prize will be forfeited and we shall have the right to select a different winner on the same conditions except that we shall only be required to make one attempt to contact each further winner selected. 6.2. The Prize will be delivered to the Winner within 20 (twenty) business days from the date the Winner is confirmed. You agree to provide us with all the necessary information to enable us to deliver the Prize to you. 6.3. Should the Winner for whatever reason fail to accept the Prize within 20 (twenty) business days from the date the Winner is confirmed, the Prize shall be forfeited and we shall be entitled to select a different winner. 6.4. The Prize may not be exchanged for cash or any other item. The Prize is not transferable. We reserve the right to substitute the Prize, or part thereof, with any other prize of a similar commercial value. 7.1. Any reference to the organisers includes the directors, members, partners, sponsors, agents or consultants or the organisers, where the context allows for it. 7.2. The Winner will be requested to provide a copy of his/her valid identification document and should he/she fail to do so within 5 (five) business days from the date it was requested, the Winner shall forfeit the Prize and we shall be entitled to select a different winner. 7.4. Where relevant, if a person does not accept the Prize as required herein, if an entry is not valid for whatever reason, if an entrant has breached these terms and conditions, if a person renounces the Prize or we deem such person to have renounced the Prize, we reserve the right to declare the Prize forfeited and/or choose a new Winner. 7.6. We assume no risk and/or liability whatsoever for the failure of any technical element in the Competition which may result in your entry not being successfully submitted and/or the winners not successfully receiving or taking up the Prize. Once the Winner accepts the Prize, the Winner accepts such Prize at his/her own risk. 7.7. We assume no liability whatsoever for any direct or indirect loss, harm or damage arising from your participation and/or any Prize awarded in the Competition or for any loss or damage, howsoever arising. All persons, whilst participating in this Competition, indemnify and hold us harmless for any loss, damage, harm or injury (whether arising from negligence or otherwise) which may be sustained as a result of any claim, costs, expense, loss or damages which may be made by any third party. 7.8. If required by the Minister of Trade and Industry, the National Consumer Commission or for whatever other reason, we will have the right to modify or terminate this Competition with immediate effect and without notice of such modification or termination. In such event, all entrants hereby waive any rights, which they may have against us and hereby acknowledge that they will have no recourse or claim of any nature whatsoever against us. 7.9. The Competition is in no way sponsored, endorsed or administered by Facebook or Twitter and any correspondence related to the Competition should be directed at us and not Facebook or Twitter.